We recently saw this image and thought about all the lovely young women we know who might relate to its message. We've talked before about "highly sensitive teens" and the often overlooked value in having an introvert's disposition. As the school year kicks into high gear, it's important to remember that, while the schools are often high-energy extrovert-rewarding environments, they can feel pretty overwhelming to the teen who needs more solitude and time for quiet reflection. It's our job to be kind and thoughtful of everyone's need for connection and separateness and to really value the teens whose hearts look like the image above. We can remember that intense levels of social engagement can be really draining for the introvert, even if she considers herself to be outgoing. 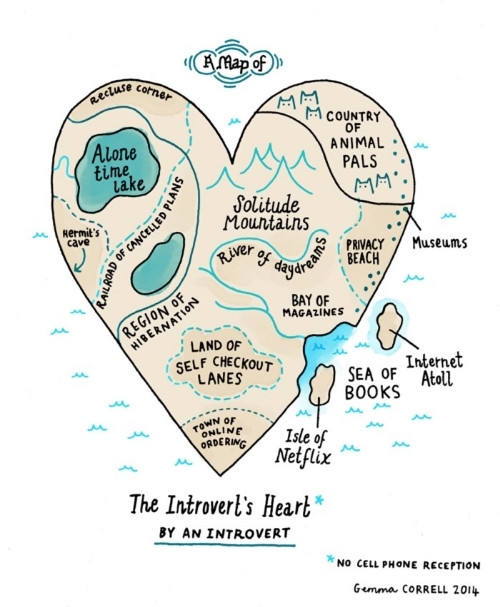 Introverts aren't necessarily shy or reserved; they simply draw their energy from time spent in solitude, enough to recharge and engage socially. Extroverts draw energy from their socializing, and can end the school day feeling upbeat and ready for more time with friends, while introverts may need a good chunk of time to decompress after a day surrounded by high-energy peers.